Work has now finished at the most northerly gin distillery on mainland Britain with the final piece of equipment – a new still called Elizabeth – installed in the new custom-built distillery at Dunnet, Caithness. Husband and wife team Martin and Claire Murray, the founders of Dunnet Bay Distillers have distilled and tested the first batches of Rock Rose gin (as announced by The Drinks Report last December) and full production will be under way in time for the opening of the new micro distillery on August 21. Over the next three years, the company will receive support of £83,990 from Highlands and Islands Enterprise (HIE), which the owners say has put a huge amount of effort into helping them develop their Rock Rose gin. Claire has been working with experts in Caithness to research local botanicals, which can be used to flavour the gin. Martin currently works in the oil and gas industry in Aberdeen and has a master’s degree in process engineering. He is now studying for a pHd in brewing and distillation at Heriot Watt University. As part of this study, he worked with the centre on a number of research projects to assist with product development. Located in the Bay of Dunnet where fresh air and pure water is in abundance, Martin and Claire’s goal is to create a spirit which reflects the Caithness way, carefully and slowly distilling by hand to create the product. Claire says: “Each year we will create a new vintage. Our Caithness botanicals are dependent on our climate resulting in a truly hand crafted gin that will change year on year, but is still undeniably Rock Rose. 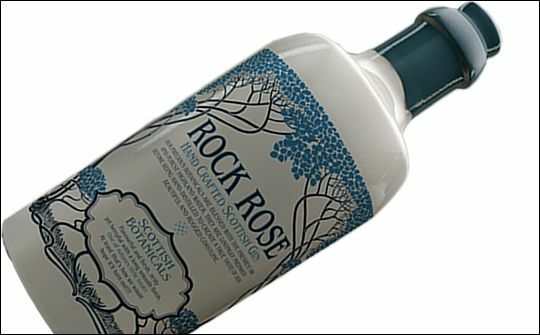 “Rock Rose gin was named after our first botanical forage along our Caithness cliffs, where local herbalist Brian Lamb introduced us to Rhodiola Rosea, a rose in the rocks. Hundreds of years ago, the Vikings would pillage these wild exposed cliffs to gather this precious plant, which was thought to give them extra strength to continue with their long, arduous journeys. Martin adds: “Since the new still arrived, we have been making some trials and we look forward to launching Rock Rose at the end of August. We aim to make about 700 bottles in every batch, producing about 10,000 bottles a year. The first batch sold out by pre-orders within 48 hours and the second batch is expected to be released in early September.